The Wethersfield Volunteer Fire Department is the oldest continually operated fire department in Connecticut. Formally charted by the state legislature in 1803, the department has fought fires using a variety of methods that reflect various changes in technology and social structures that have occurred over the last 200-plus years. Back in the early 17th century, fire control in Wethersfield consisted primarily of responsible and helpful citizens toting buckets of water to blazes—usually afflicting homes and barns. In 1690, citizens of Wethersfield voted to purchase ladders and leather buckets for storage in town to ensure ready availability of this essential firefighting equipment. By 1803, the First Ecclesiastical Society successfully petitioned the Connecticut General Assembly to charter a volunteer fire department in Wethersfield. The department started with just 16 men and 2 “force pumps” that could be drawn to the scene of a fire by men or horses. The new volunteer company saw a tremendous amount of action throughout the 19th century, including two catastrophic fires in Wethersfield in 1831 and 1834 that, despite the firefighters’ efforts, destroyed dozens of buildings. 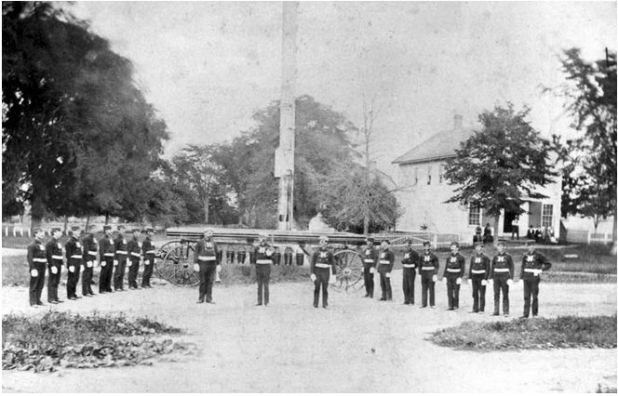 On October 16, 1858, the department received its first full-sized, hand-drawn fire engine, nicknamed “The Neptune.” Having recently purchased the unit from the city of Hartford, the department employed 42 men to pull the giant unit to fires and keep it pumping. Two-minute shifts of 16 men each operated the pumping arms. Shifts were brief given that the arms needed to be pumped up and down 60 or more times a minute in order to create sufficient and steady water pressure. Meanwhile, others continually filled the engine’s water reservoir. Reportedly, the Neptune could spray water as high as 70 feet in the air. The 20th century brought dramatic change to firefighting in Wethersfield thanks to rapid advancements in technology. In 1915, Wethersfield purchased a motorized Republic pumper with a gasoline engine and solid rubber tires. In addition, the expansion of telephone service and the introduction of short-wave radios in the middle of the century improved firefighting communications. In 1953 the department purchased a $30,000–$40,000 US Army surplus amphibious vehicle (known as a “Duck”) for $50 as a way of fighting fires on the water. Eleven years later, they added a 100-foot aerial ladder truck, the first operated by a volunteer department in Connecticut. Today, Wethersfield utilizes 3 firehouses, 15 vehicles, and 2 boats in its efforts to eliminate the threat of fire and provide rescue services. Included among these forces is the original company chartered by the state in 1803. In addition to serving Wethersfield, the department also participates in a cooperative program to assist the emergency services of all towns in the surrounding area. “A History of the Wethersfield Fire Department.” Wethersfield Volunteer Fire Department, 2016. Link.